After visiting Samuelson's Rocks, the day was still young. 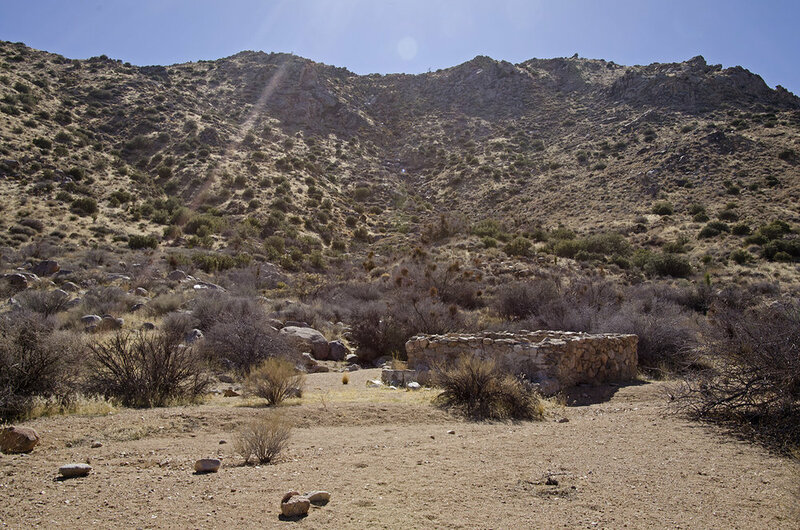 I hadn't planned on hiking anywhere other than the Rocks, but I knew Quail Springs was about a mile or so southwest, so why not try to find it? There was something interesting there to find, odds were. I didn't have the coords for my GPS (not unprepared, just mis-planned :-)), but I "remembered" exactly where it was on the map in my head. So I set out to find it. Note to self: Never trust the map in your head. I checked my GPS to see if by chance the spring was mentioned on the map, but it wasn't. Maybe I had entered the coords I needed way back when? Nope. What to do. After hiking all that way, I didn't want to return to GrayTac without having found Quail Springs. On a whim, I checked my phone. As luck would have it, I was in one of the three places in the park that has a cell signal. I phoned the intrepid 3-D photographer, Murbachi, who happened to be at home and in front of his computer. With the help of Google Earth, he soon gave me the information I needed. Backtracking, I made my way to that first canyon and wash I had passed when I turned that corner on the northern mountain back over yonder. Heading up the alluvial fan, I may have uttered "Eureka" when I saw the reservoir at Quail Springs. "Ta-da!" I don't know about you, but that's what I sometimes say when I find something really cool out in the desert. I thought this was pretty cool, a watering trough built into the front of the reservoir. Cattle, horses, mountain lions, sheep and other critters must have been thankful. And that small, walled-off corner? I got nothing. The water source for this reservoir probably started out as a spring up in the canyon above. It was further developed, however, by driving a tunnel through a granite formation. The water was then piped about one-quarter mile down to the reservoir. Traces of the old pipeline are still in place. Reports exist of this work being done by a J.A. Myers who grazed cattle in the area. The inscription "Bud White" is in a portion of the water trough, which may have been added at a later date than the reservoir. The water at this location was reported to be excellent and was used by a number of cattlemen from the early 1900s through the early 1920s. A series of arid years eventually resulted in the spring drying up. I'd bet that a few years of wet weather might bring it back. A portion of the pipeline heading up to the source of the water. A little way above the reservoir, this rather large stone watering trough sits, dry as a bone. 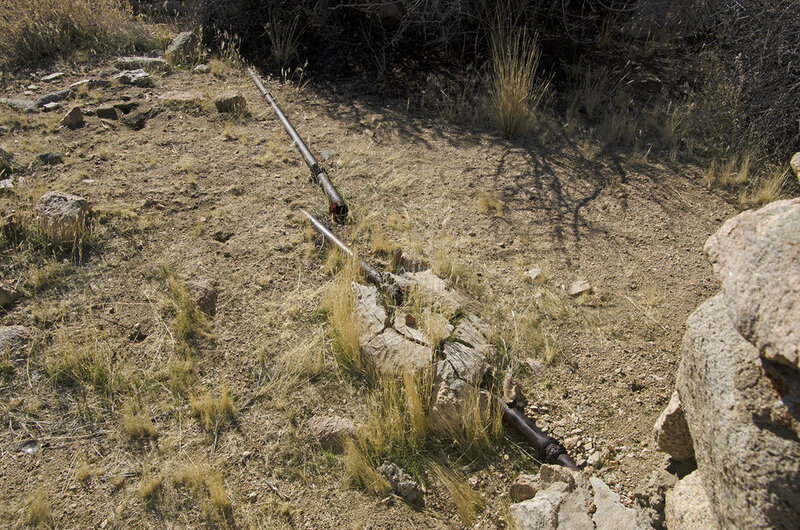 The work put into this trough and the reservoir below is evidence of the good supply of water that once helped settlers, travelers and animals survive in the area. There are reports that John Samuelson would drive his truck to this spring to fill up the water tanks he would use at his ranch. Egads, that's a long hike back to GrayTac. By this time, I was feeling a bit tired, having hiked quite a bit farther than I had planned. I still had a bottle of water and some tough jerky, so I knew I could make it back safely. I commenced hiking, thankful that I had found another place on my JTree hunt and seek list. Definitely worth the hike, and I know there is more to find in this area, so I'll be back.